Thank you for dropping by. I am so excited to show you a new card for Viva Las Vegastamps! 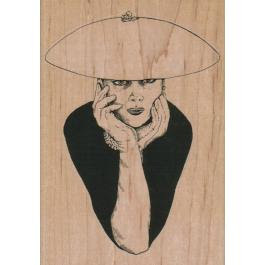 I love this woman image, she looks so haughty, and the sentiment with her makes me giggle. 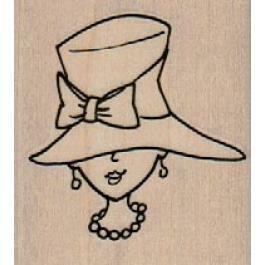 The lady is called Pretty Lady in Fancy Hat and she can be found here. The sentiment used is called American Express Called and can be found here. The image and sentiment were stamped on high gloss paper, then painted in with tombows using watercolour paintbrush and water. The card was assembled using Miracle Tape. There are so many widths of tapes to choose from and even sheets, and if you haven't tried it yet, you will NOT be disappointed! Terri Sproul shows you how to make the 3-D flowers used in the cards, wreath and bouquets by Cheryl Lindsay using rubber stamps and materials available from Viva LasVegastamps! come see more samples of Vivalasvegastamps! 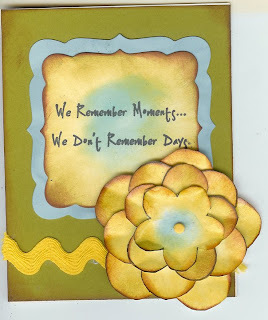 new 5 petal stamps on my blog. you will be amazed at all the things you can do with this wonderful set. This is what happens when you go crazy with Roses!!! This entire set is on Special, check it out now! 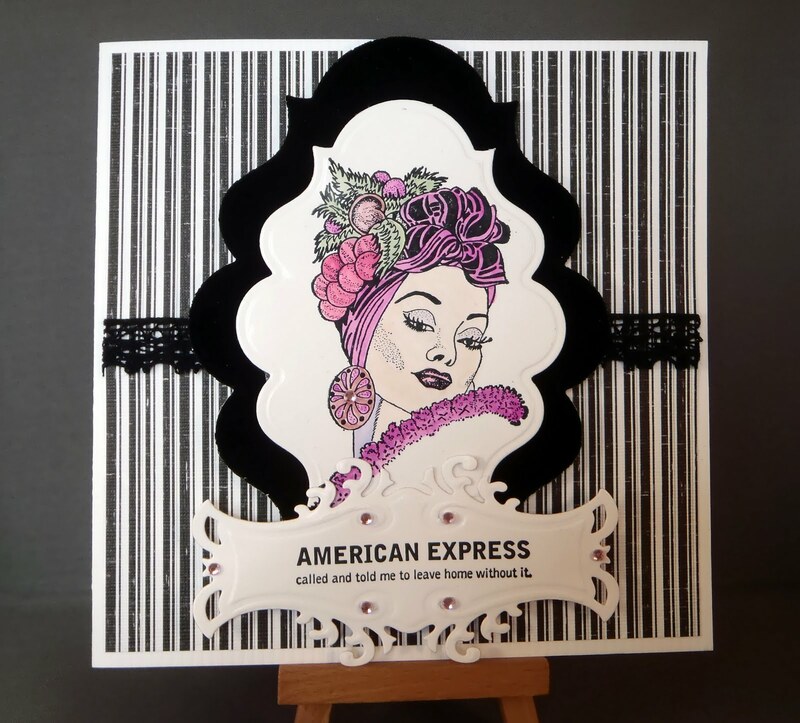 Three videos on embossing techniques and how to make fancy embellishments with the new Viva Las Vegastamps! five-petal flower. 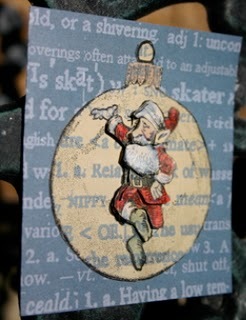 Jolly Elves will dance their way into into your heart. As you'll see I love to stamp on printed paper, I love the feeling it gives the piece. I love this little "dancing elf" There are so many ways to use this versatile little guy with his little out stretched hands to hold things and his little tip toe feet to stand on anything. All stamps in this post are done with water color pencils. 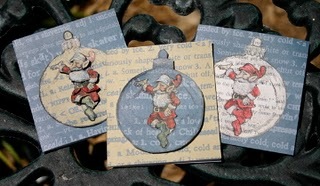 "Holly Santa" item number 14721 (plate 1205) , "Dancing Elf" item number 10106 (Plate 975) and "Christmas ball " item number 9234 (plate 290) in many of these. All 3 of these stamps are very versatile. I was thinking that elves have a great deal of down time between Christmas'. So I decided they needed a summer job, so why not 4th of July elves? That still gives them an awful lot of free time. We may have to find them other holidays to work? Friendship, Flowers, and Fun - OH MY! I'm so happy the weather is FINALLY getting warmer! I thought yellow and orange were perfect timing and so was this Sunflower with Ladybug Rubber Stamp from Viva Las Vegastamps! I really wanted to keep it simple this week with a quick and easy card. I really like this stamp because it has it's own built-in boarder! I used Prismacolor Colored Pencils and cut around the edges and stuck it to some card stock. 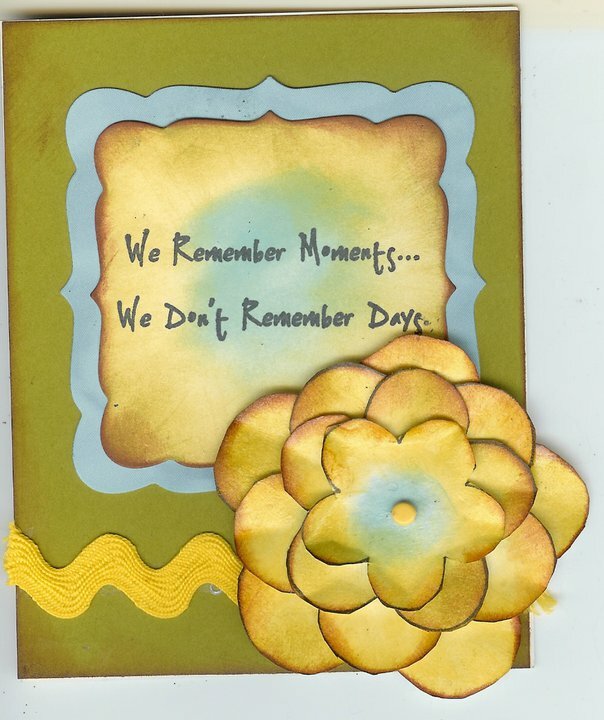 I also found some vellum phrases and 'there ya go' - a quick and easy card! I found this to be one of those PERFECT Rubber Stamps to work with...you, see, for years I was intimidated by many rubber stamps because I didn't always get a nice, even ink on it but this worked really well and it's a smaller stamp but big enough to shade and blend a little too! I hope you will swing by my blog! And don't forget the shop, too! Hiya Viva followers!! I am a huge fan of making my own embellishments; whether it's alphas, shapes, epoxy brads, rosettes... etc. etc! 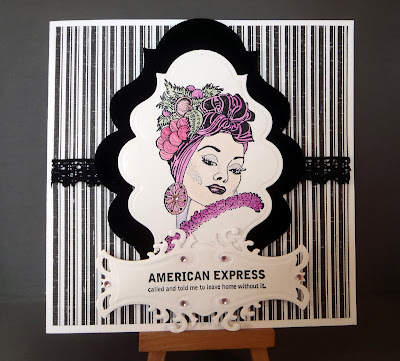 and today I'd like to share with you a huge rosette I made featuring a Viva Las Vegastamps! original! I stamped the Dandelion onto a piece of cream cardstock in StazOn Saddle Brown and did a little bit of clipping as I cut it out, not being too fussy on purpose because I want it to stand out! I nabbed some vintage lace, a gorgeous pink and cream patterned paper and I started layering. For the card base I used the same color cardstock and patterned paper, distressed both with TH Vintage photo distress ink and wrapped with a simple cream colored crochet thread to imitate bakers twine! I topped off the rosette with an American Crafts pearl brad and strung some pink beads on a dark brown upholstery thread... secured everything with Miracle Tape and VIOLA! A hint on making the pink rosette... use a scalloped scissor to cut your strip of paper.. scallop OUT on both sides (so that there are BUMPS on the outsides.. not cut IN) and then accordion fold where the scallops meet... make sure it's long enough to fold around and secure onto a piece of cardstock with miracle tape! 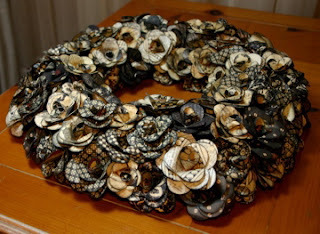 You can use all sorts of things to layer, I encourage you to experiment have fun making your own rosette style embellishments.. easier to match colors and you can do all sorts of amazing things with textures, patters and shapes. use feathers, old fabric swatches, recycled cardboard, magazines... they'll all provide amazing different styles to your work! And the stamps are so easy to customize that they are the perfect addition to making your own embelly!! Here is a Christmas Card I just made for my Festive Friday blog Hop I have on my blog on the 2nd and 4th Friday of each month. Check us out. Gears - Viva Las Vegastamps! 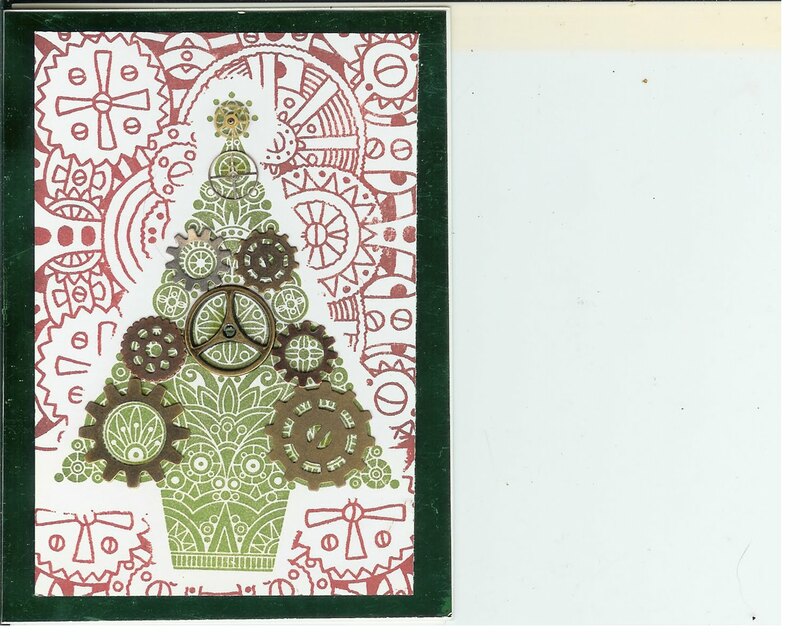 1) Stamp tree image onto Post-it Note or any thin white paper (like typing paper) and White Cardstock. Cut out tree image on Post-it note. 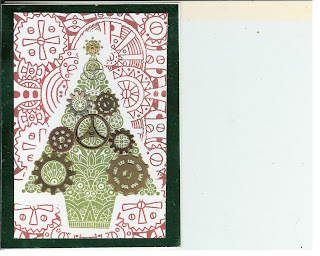 I stamped tree image using Green Dye ink onto my white cardstock. 2) Place Post-it note image over Image on White cardstock - Post it note will act as a mask to protect the Image on White Cardstock. 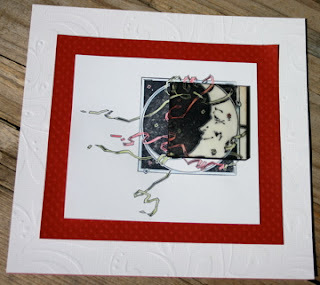 3) Ink up "Steampunk Background" stamp with "Cherry Red" dye ink and stamp over the Tree Image. Stamp until your background is covered. Then remove your Post-it note tree image and see how it protected the image on the white cardstock - cool! 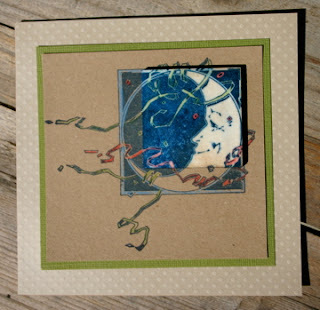 4) Adhere Glossy Green Cardstock to cardbase using Miracle tape and then add Stamp image to the center of Cardbase - again using my Miracle Tape. 5) Start adding Viva Las Vegastamps! Gears to Tree Image... see sample. Thanks for stopping by today and remember to stop by again as we have a new project on this Blog from our Design Team on Monday, Wednesday, and Friday! I had so much fun creating this mixed media art card. 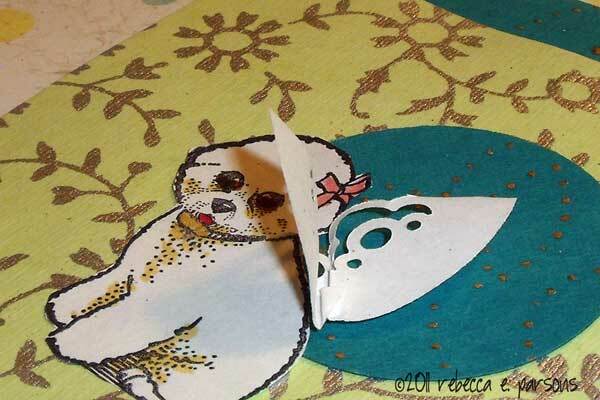 I used a dog stamp from Viva Las VegaStamps to create the 3-D angel dog. 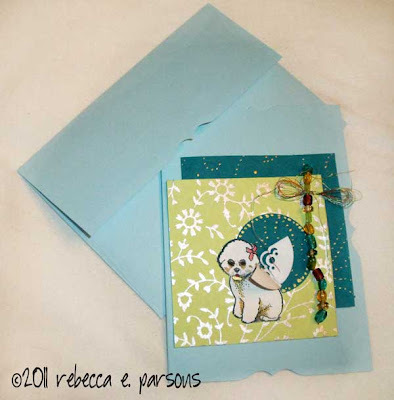 To create this mixed media artwork card, I stamped the dog image on white watercolor paper and shaded it with Copic markers. I punched a 2" circle of white paper, cut it in half, folded it and used a corner stamp to punch the design. I combined the dog and wings on three layers of handmade paper. I painted dots around the circle with gold metallic acrylic. Then I added beads and metallic threads along one side. Thank you for stopping by today. 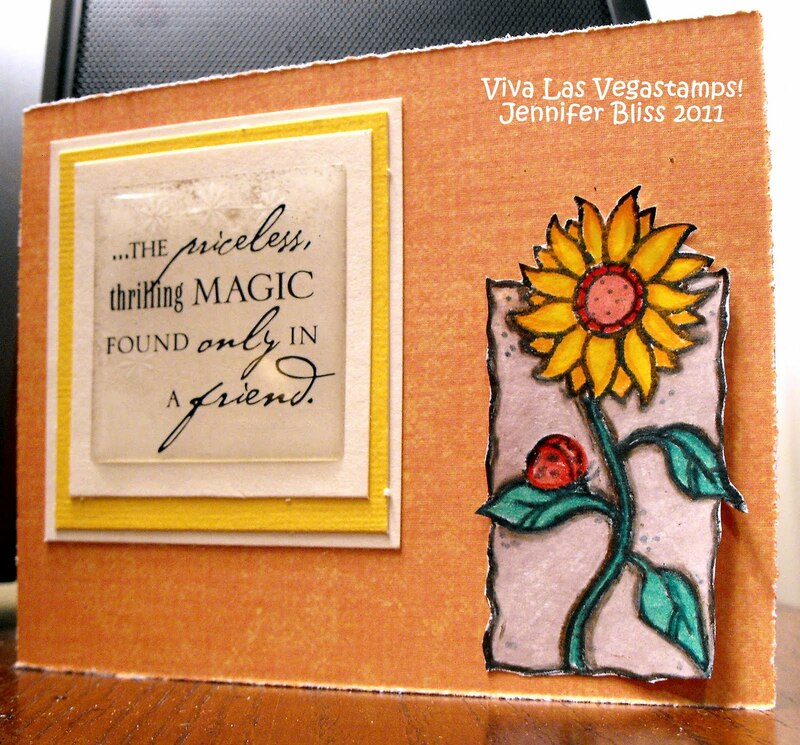 It's Kim here, with another project using the fabulous Viva Las Vegastamps! I decided to use the Sure I shot the Sheriff stamp, because I have a warped sense of humour! When I saw this stamp it just made me chuckle, and I knew I had to have it. 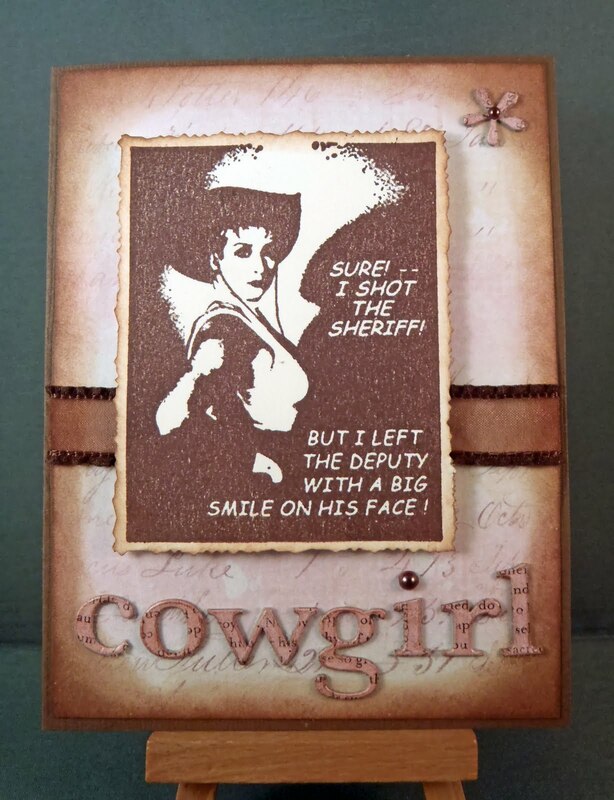 The image (Sure I shot the Sheriff - Image 15080) is stamped on vanilla cardstock with chocolate Ancient Page ink, and then cut out with deckle edged scissors. 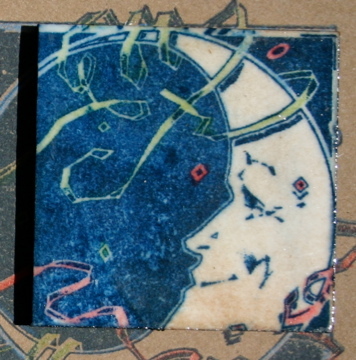 I then lightly distressed the edges of the stamped image as well as the patterned paper behind it. 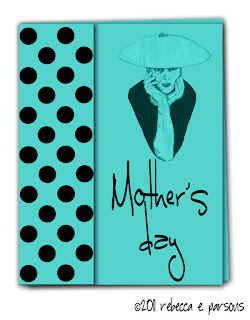 All layers are put together with Miracle Tape, and lastly the stamped image is pop dotted up. 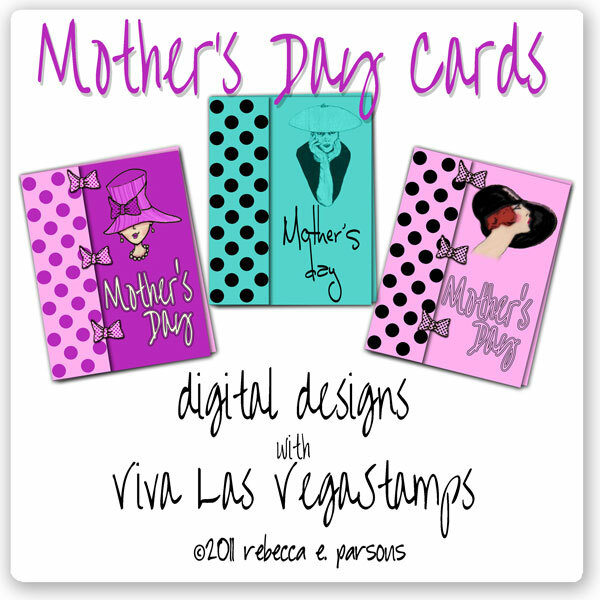 Please click on any of the links above to be taken directly to the product used, and while you are there, stay and browse awhile at all the FANTASTIC images at Viva Las Vegastamps! For this card I just simply stamped the image in black ink. I did no coloring. I used a punch to give my notebook paper the "notebook" look. I was lucky enough to find some fun number paper that goes perfect with this stamp. Then I added some bakers twine. Make sure you go to Viva Las Vegastamps and get some stamps!! While you are there pick up some Miracle Tape!! LOVE this tape!! I honestly couldn't wait to use these stamps from Viva Las Vegastamps! You, see, I've been accused more than once of being a hippie. It's almost a joke now. 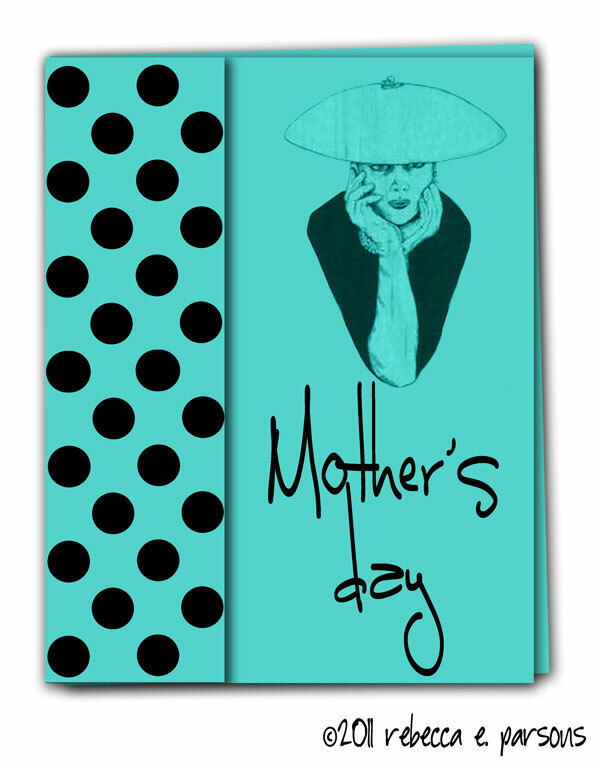 I have been wanting to do more Door Hangers, too, so I thought it was PERFECT! I just found a template online somewhere, printed it, cut it out, and started smearing my ink pad everywhere! 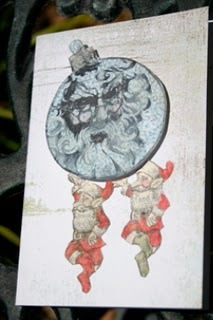 I used Tim Holtz Ranger Ink - Distressed Ink. 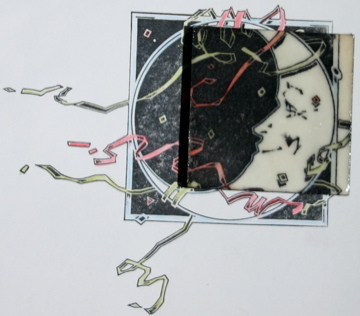 I then used Black ink for the stamps. I used a little bit of 3 different Stickles colors, too. Remember to swing by the Shop HERE and the Blog HERE and MY BLOG is HERE! 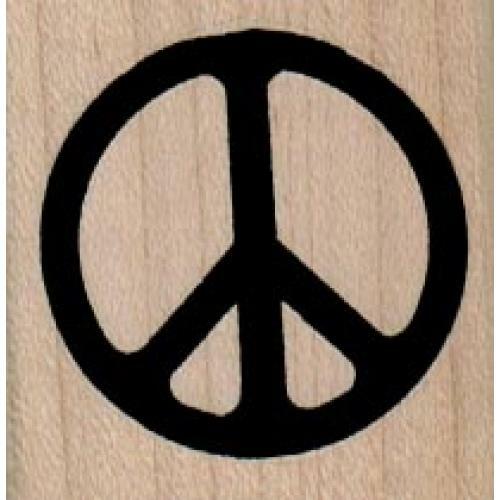 And tell 'em the HIPPIE Sent Ya! Good morning blogland!! Viva Las Vegastamps! 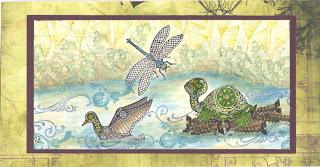 has so many gorgeous stamps to offer.. and in such great varieties that I've been trying to share lots with you.. they have great detailed stamps, cartoony stamps, phrases, pictures, drawings.. today I want to show you a great REALISTIC stamp. And I can't get over the amazing amount of negative and positive space. It's the perfect "coloring" stamp! 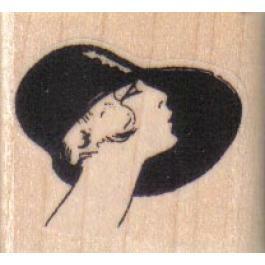 I chose to stamp my stamp with Momento Tuxedo Black ink (Also available at Viva Las Vegastamps! just click the link!) which is a permanent waterproof ink in a very rich black. I colored it with Prismacolor Art markers... you could also color with chalks, copic markers, colored pencils, water color, or your favorite stamp pads! My adhesive of choice was Miracle Tape - which holds ANYTHING to ANYTHING - including the plastic recycled netting to my card base! 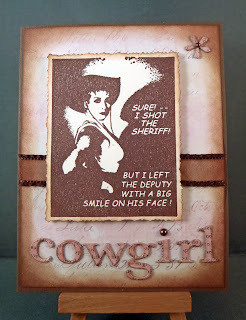 Other supplies: KnCO paper, rhinestones, distress ink, stickles, and a 7gypsies stamp for the script.. a great substitute for the script would be Viva Las Vegastamps! 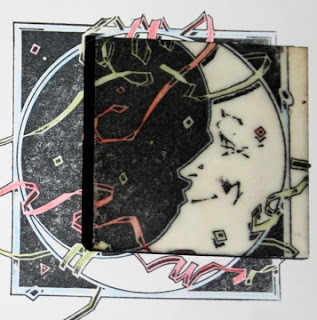 's Writing Background 4"x4" stamp #16207 or any of their other writing background stamps such as 14641.
item number 2265 which is 4 1/2" x 4 3/4"
Above is my very well love and used stamp! I love the versatility of this stamp. Here I have decided to use it for Christmas....but I have thought about how great it would be for New Years, Birthdays, Party invitations....the uses go on and on. Since VLVS now carries Ecoartboard, Tsukineko embossing stamp pads and Miracle tape I decide to combine them in these combination cards. I have used my Jewelry making ideas and have incorporated them into cards. 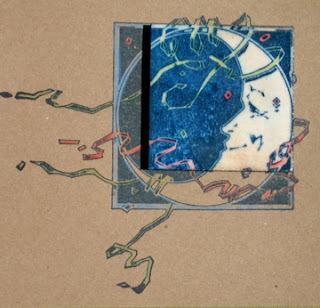 moon in the first card. layer of VLVS! Ultra High Gloss Embossing Powder. I heated the powder with a heat gun, and repeated this process several times to get a heavy, smooth, glaze over the top. These pieces could easily be converted to jewelry pieces. 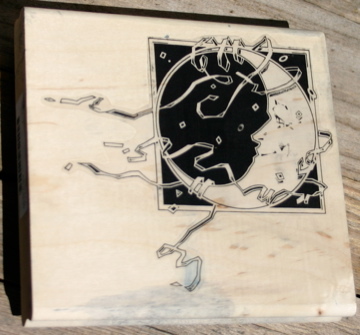 after lining up the ecoartboard with the design I adhered it down. (Miracle tape works great for this). 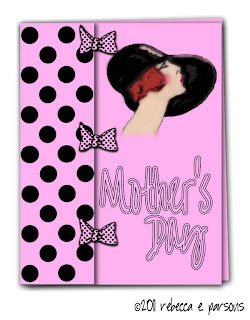 These cards were created with three of the beautiful women's face stamps from Viva Las VegaStamps. VLVS has over 75 images of women's faces available to you. Being a digital mixed media artist, I love to combine traditional elements with digital. 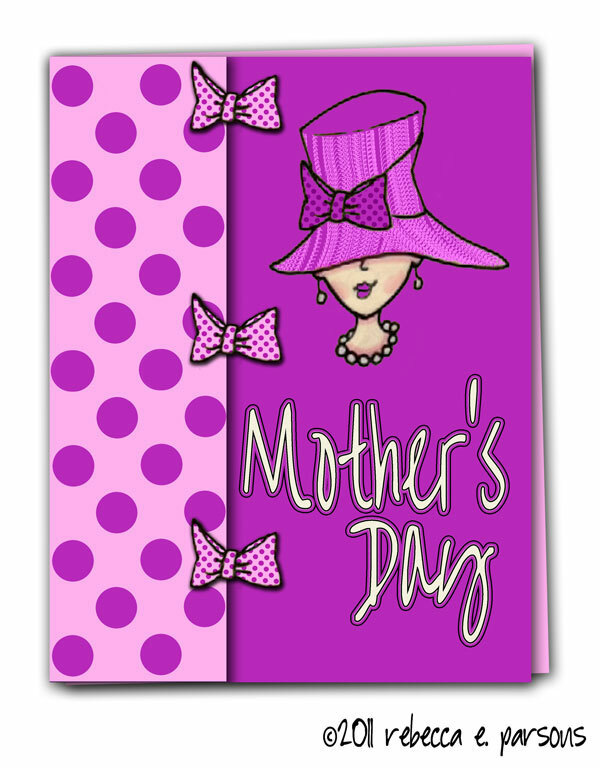 For this set of cards, I wanted to show stampers how easily it is to use the stamped images with digital elements. I also wanted to create three different cards using the same few design elements. It is important to note that you must respect the stamp manufacturer's copyright policies when creating anything. I stamped each image on white paper and scanned them into PhotoShop. 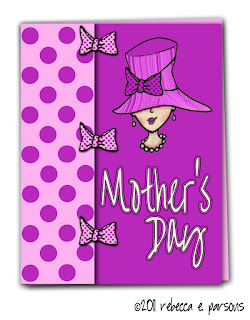 I created the card background elements in PhotoShop. The faces were colored and decorated digitally also. Thank you so much for stopping by today. My project today features a beautiful woman's face, from Viva Las Vegastamps!, (#5908) on the front cover of a book I made! The book has chipboard covers, but the rest is patterned paper and envelopes. I had a blast making this, and will be making more for sure. 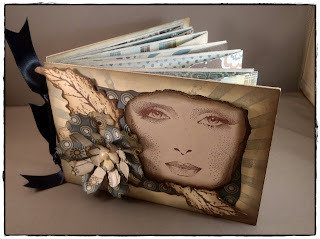 This book was put together using Miracle Tape from Viva Las Vegastamps!, if you haven't used this product yet, it's awesome, and, it comes in many different sizes and even sheets. 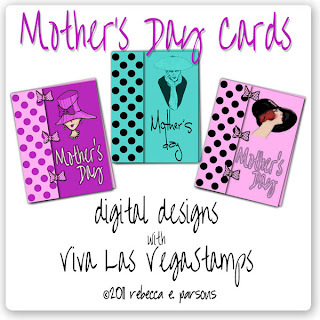 Stop by Viva Las Vegastamps! and have a look at all the awesome stamps over there, you won't be disappointed. 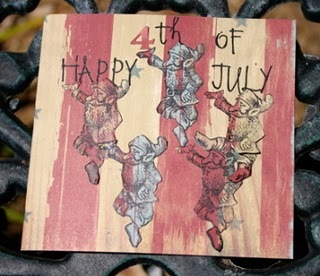 Fun card by Rebecca Stiles using Viva Las Vegastamps! So I hate doing housework!! If I was rich I would have a maid for sure!! When I bought my "pound o rubber" from Viva Las Vegastamps and found these 2 stamps I knew they just had to go together!! I just used some random background papers here. I used a punch on one of them to give it a "notebook" look. Image is stamped in black ink and colored with Copic markers. Make sure you go to Viva Las Vegastamps and buy some new stamps. After all stamping is way more fun than housework!! 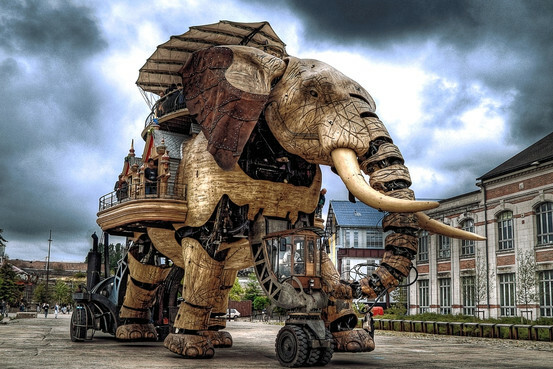 and see all the amazing projects we post. Here is a fun and super easy video on how to make your own background paper using Miracle Sheet. 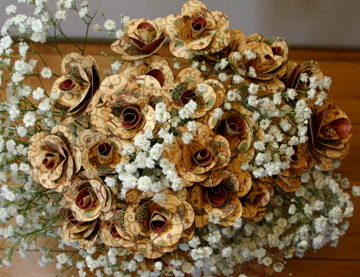 Great way to use up your scrap paper! Hope you enjoyed, I will have this Book on my blog as soon as I finish it.. Hope you stop by my blog and become a followers.